Today marked the opening ceremonies of WUOC 2016. Over the past couple days the team has trickled into Miskolc, Hungary and has explored the gorgeous surrounding terrain. Most of said terrain is either broad hillsides with small point features or large, very circular collections of deep crater-like depressions. The woods are (for the most part) very open and fast underfoot. This year's opening ceremonies took place in Diósgyőr Castle. We followed a jester to the moat of the castle, where the 'king' and 'queen' welcomed us aided by the firing of a canon. I think we all jumped a little! Upon entering the castle, the sound of medieval music filled the air and armored guards lined the passageways. Once the speeches and raising of the flags was over, a juggler on stilts entertained us for a spell, before we were released back into the (rather boring) modern world. Tomorrow marks the first WUOC race - the individual sprint. For those wanting to follow along online, you can visit here. Emma Sherwood even has a GPS! 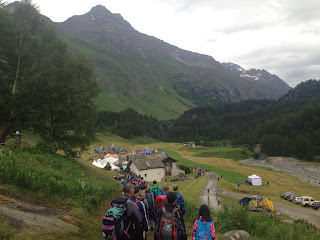 Swiss O Week (SOW) 2016 took place in the Engadin valley in the eastern part of Switzerland, very near to the location of this year’s JWOC races. 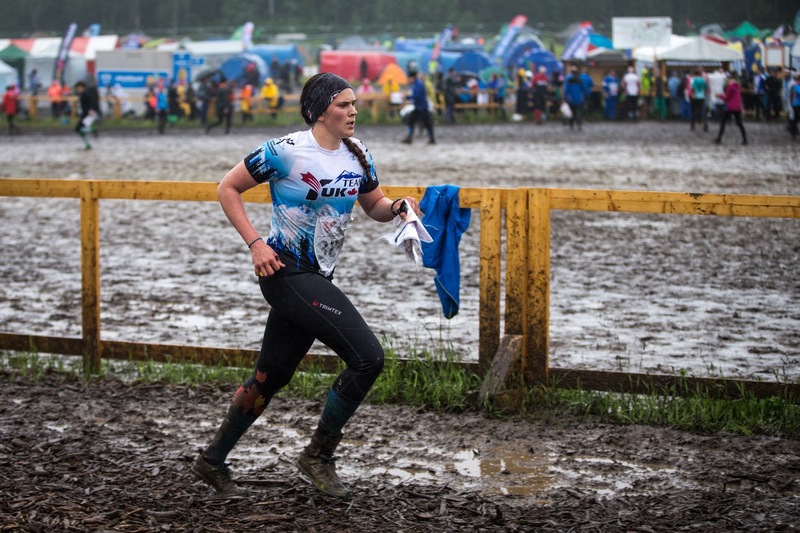 Because of this, many JWOC athletes also raced the SOW races, along with some other Canadians. HPP athletes racing SOW included Pia, Nicole, Emma W., Emma S. (me), Robbie G., Jan Erik, Tomas, Leif, Christian and Michael. There were some very good results by Canadians including top 25 results in their respective categories on individual races by Robbie, Leif, Jan Erik and Emma W.
The format of this race series was 3 middle or long distance-type races, a rest day and then another 3 races. 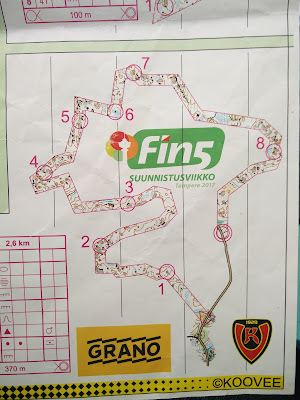 My favourite race was probably the last day, which started with some fairly physical legs before a map flip for forking and a more technical section. Here is the D20 map for the last day. What routes would you have chosen (especially for 2-3 or 15-16)? 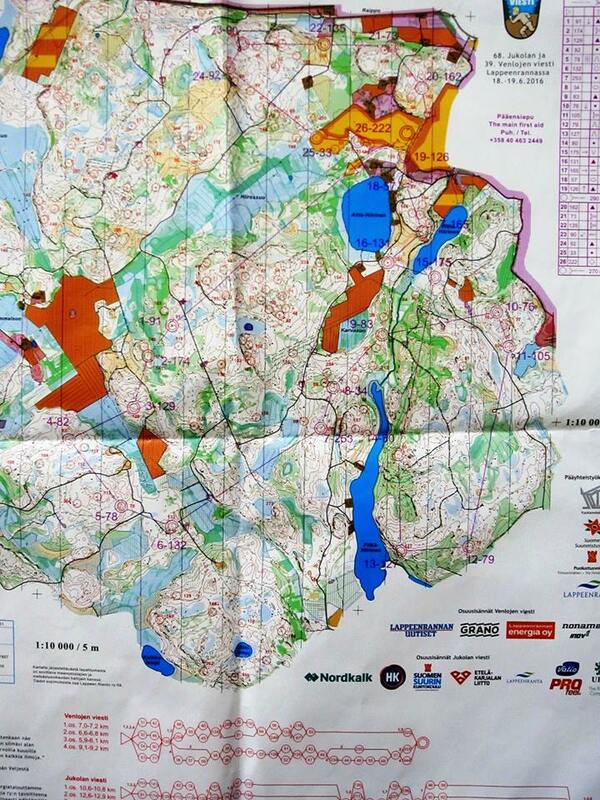 You can see the route choices of a couple of the competitors including Pia and me here. Canadians took advantage of the rest day by going exploring: hiking up mountains, wandering through towns, or even going to Italy. It was a really cool area with lots of fun things to do. 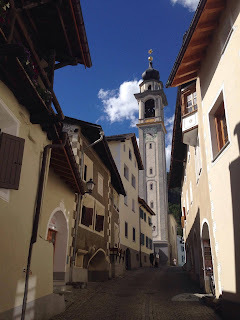 This is a picture of Samedan, a town where many of the Canadian juniors and were staying. All in all, it was a very fun week where we had ample opportunity to test our orienteering skills. For me and some other Canadians, it was a nice week too rest and recover a bit for upcoming events but still appreciate the awesome Swiss terrain! 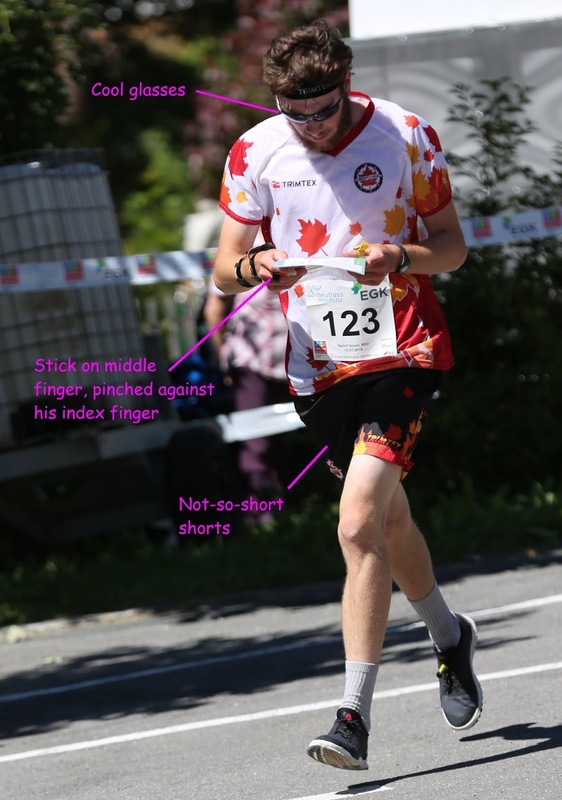 Most of the Canadian team is continuing on to other competitions such as the Canadian Orienteering Championships in Alberta or the World University Orienteering Championships in Miskolc, Hungary. Stay tuned for updates on those competitions! The morning of the Sprint started with some typical pre-race jitters and the superstitions that Erik informed you all of. (Yes, lucky hairbands really do work!) You could tell that the others were also nervous, but excited to get the day rolling. 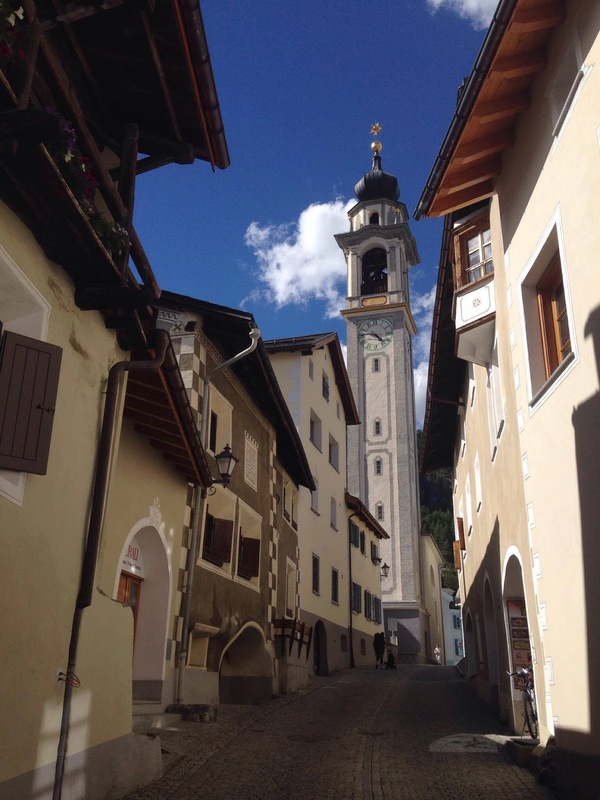 We all headed down to the town of Scuol to warm-up for our races, and by then the day’s heat was already settling in nicely. The W20 course was 3.3km, with 85m of climb and a set winning time of 14 minutes (Which was crushed by Simona Aebersold in 13:13!). The course consisted of two sections of technical legs in the town area separated by a long leg. The key here was to plan ahead for that long leg whenever you go the chance. Another good tip that the team had discussed before the race was to look up for obvious features like water fountains or building that stick out more. That way, you can focus on one bigger thing rather than checking off many smaller ones since many alleys and streets looked similar. The route-choice leg was long and had some different options.The park route, which I took was shorter, but had lots of twisting and turning. Which route would you take? Exiting the town section, we had an uphill leg from 9-10 where many of us lost a lot of energy. 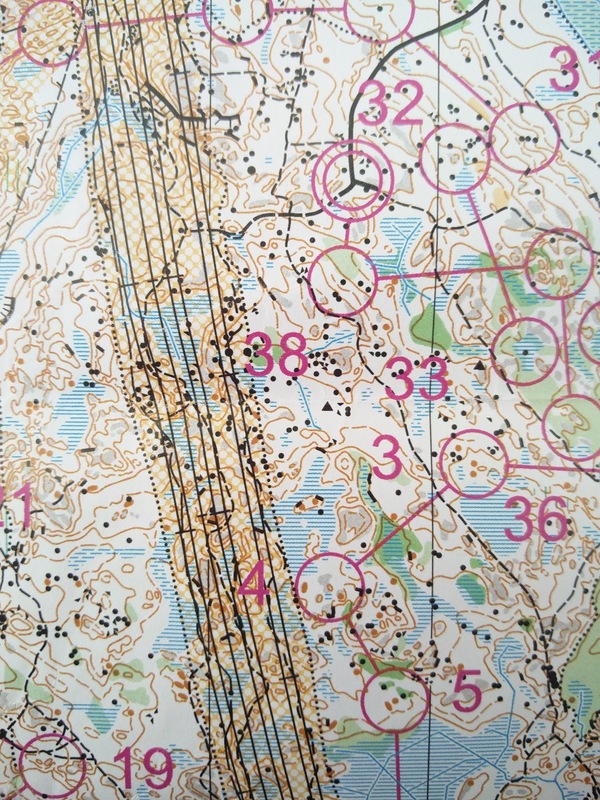 Following that, there was an easy leg to a spectator loop and a map flip. The second map had a few legs in an open park that was riddled with some false fences just to mess with you. Personally, I lost some time in the spectator loop because I flipped my map over too early and couldn’t figure out where the loop shot me out to. After some re-focus however, I got right back into it and tried to tell the burning in my legs that it was almost over. The Canadian boys did well with the top placing for Robbie Graham in 111th place with the best % behind the winner for Canadian men since 2013. For the women, I held a similar placing to last year in 30th place (compared to 28th in Roland!) and the others put in some solid places. Monday began at 5:00am with an early breakfast and a 2.5 hour journey to the quarantine, high up in the Fuorn pass near the Italian border. The previous night's chills beginning to fade, I set out on the 8.8km course across open pastures and daringly steep hillsides. With 450m of climb at an altitude of 2200m, the winning time was set at a surprisingly long 70 minutes for such a short Long. 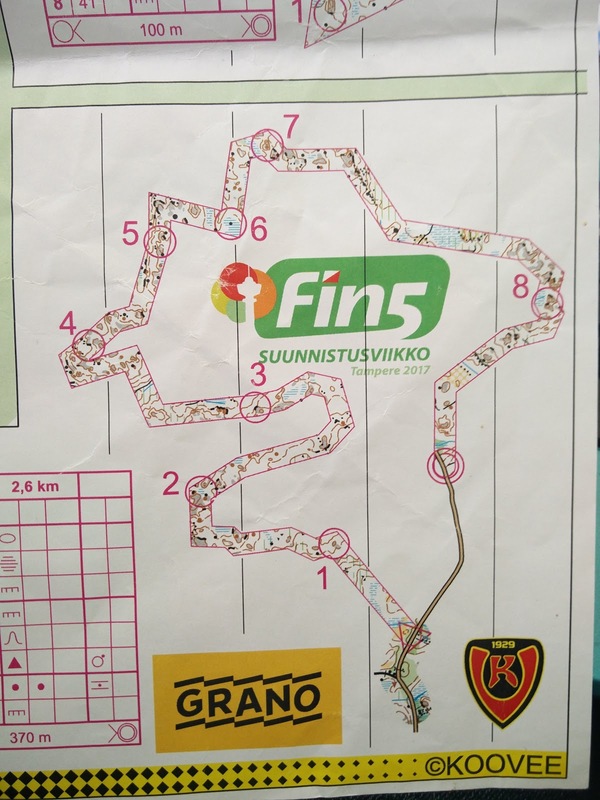 The course started in a rather technical but open section of the map, with some detailed contours and some opportunities to lose some time early on in the race. For me, it was a matter of easing into the terrain, not taking too fast out of the start chute, and keeping absolute control of my navigation as I headed through to control 4. From there, the course alternated between physically demanding long route choice legs and short bursts of highly technical contour navigation. Leg 7, shown below, gave approximately equal times to both routes, though staying high to the left most likely would have saved power for later on, of which I could have definitely used. 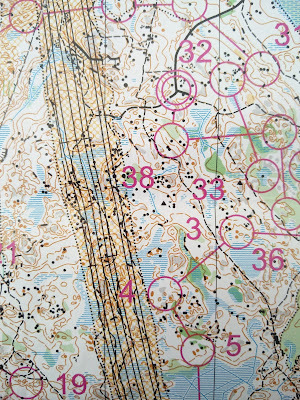 A common trend in faster route choices, even on shorter legs such as 18-19, were detours into the open fields, where running was much faster than over the rocky forest floor. The long leg to control 10 brought the M20s far down the hillside, giving way to the promised 450m of quad-burning climb. The Canadian men all finished within 03:25 of each other, spanning a mere 14 spots in a field of 156 finishers. In the end, the 70 minute winning time was beat by nearly 5 minutes in a very impressive run by Joey Hadorn. The women were not quite so close together, but they did walk away with some better results. Emma Waddington finished in 78th - her best JWOC Long result to date. A cool morning gave way to pouring rain as athletes competed for one of 60 spots in Thursday’s Middle A-Final. Starting about 150m up the hill behind our accommodation, the three men’s courses weaved down the hillside (albeit with 150m of climb), ending in the adjacent football field (European, mind you). The course ran through technical rock and contour areas, as well as long slopes where a good bearing, accurate side-hilling and an awareness of what features to spot up ahead were critical to successful navigation. It was a short and fast race, with winning times of around 25min and an A-Final cut-off of about 30min. A little too fast out of the gate, I lost about 1.5min on the first control, ending up too high above the control. After, I managed to run a clean race, keeping up a good running speed and simplifying effectively to avoid getting bogged down in the detail, finishing 1:09 behind qualifying. Pia Blake ran exceptionally well, qualifying for her first time in the A-Final. She was the only Canadian to achieve this level of performance in the Middle in 2016. After another chilly evening in the mountains, we made our way to Susch-Lavin for the Middle Final. Canada had several of our athletes in the B and C finals, who started before our one and only A finalist, Pia. 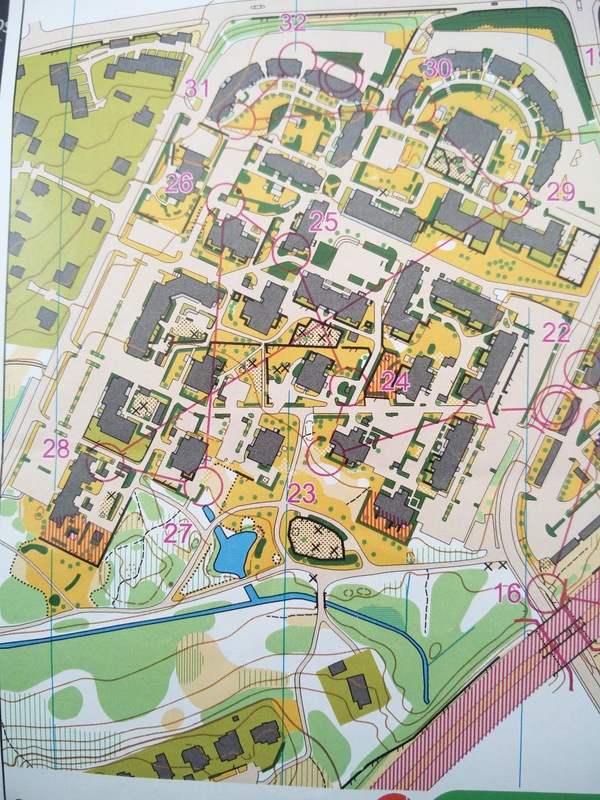 After a long, uphill walk to the pre-start, I headed off on my B final course of 2.9km with 180m of climb. The race started by throwing you right into a fairly technical area. The second leg was where many other girls had trouble since it was slightly downhill and sidehill with nothing too prominent to catch you if you went too far. They key here was to be careful and not descend too many contours. I took this leg cautiously and nailed it! Here, I caught a girl from New Zealand and we ran the rest of the race by taking slightly different routes and meeting up again. The majority of my course was pretty clean navigationally so that was a pretty rewarding after a not-so-great run the day before. Then came a routechoice leg that was common between the A and B finals. I opted for one of the green routes, which was a pretty solid route. Finally, the course descended into the arena only to go right back up into the woods again for a short little loop before punching GOat control into the finish. Nope, that wasn’t a type-o. It really was a goat. Both Michael and I had personal bests in the B final, placing 17th and 10th respectively. It was also fun to watch Pia, our superstar A finalist, on the big screen and follow her GPS along. Everyone was cheering! Pia looking happy with her race! Jan Erik approves of his face paint! The boys race started at 10:30, and Jan Erik led off our A team, and Michael led off the B team. Both boys put in solid first legs, with Jan Erik coming in 20th, and Michael in 40th. After lots of team spirit and great runs by Leif and Robbie, Canada 1 finished 22nd! Christian and Caelan led Canada 2 to finish 34th, both large improvements from last year! The girls race started at 11:15, with me racing the first leg. Right off the start I was feeling the hills from the previous races in my legs, but the adrenaline was too high to stop! Our third leg had a huge hill that most of the girls were trudging up, it wasn’t that enjoyable. For the rest of the course I managed to stick with the middle pack, and finish in 18th with a time way under what I had predicted! After a terrible first leg last year I was incredibly proud of this result! Both Pia and Nicole had similar feelings about the hills, but we all agreed that the relay terrain and course was fun and enjoyable, and a great way to end the week in 36th place! Thanks to all who supported and watched us throughout the week of JWOC. It meant a lot to all of us and helped up along the way! Thanks to our coach Jeff for always giving us helpful tips and training techniques. Thanks to Sabine and Erik for keeping us on time and getting us where we needed to be. Thanks to the o-store for getting all of us our race gear and Icebug Canada for some great shoes and Trimtex for our great Team Canada uniforms! See you next summer, at JWOC 2017 in Finland! In the leadup to JWOC 2016, team members were asked a number of questions about orienteering, and here are some long-anticipated results of the survey. 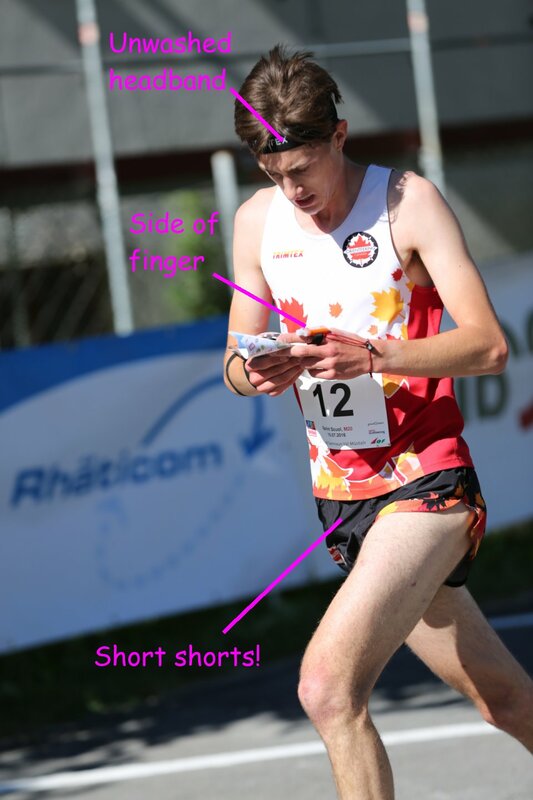 As you all know, there are two main punching systems for orienteering: SportIdent and Emit. JWOC 2016 uses SportIdent, so the burning question is "How do you hold the stick?" 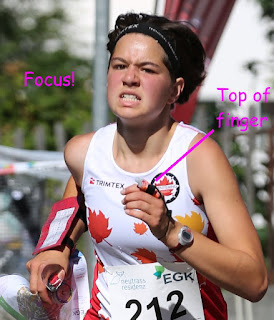 Almost the entire JWOC team wears the SI stick on their index finger (left or right), and most wear it on the side so they can grip it with their thumb when punching (does anyone remember the Sass Peepre jingle "♫♫ Thank you Pippa, 7 seconds faster...♫♫" from the 2004 COC banquet in Whitehorse?) A few people wear the stick on top of their index finger. But we have one outlier, and that's Caelan who wears his stick on the side of his middle finger. Here's the photographic proof of his heretical style (oh, and the cool sunglasses are always on, sort of channeling Cory Hart). Don't mess with Emma S! Scanning for that next control! Emma W makes it look easy! Tomas: "You should never compare yourself to others. Everyone is different. Some have to work extremely hard just to get a minimal benefit, but skills may come naturally for others. You should be your best, not somebody else’s best." 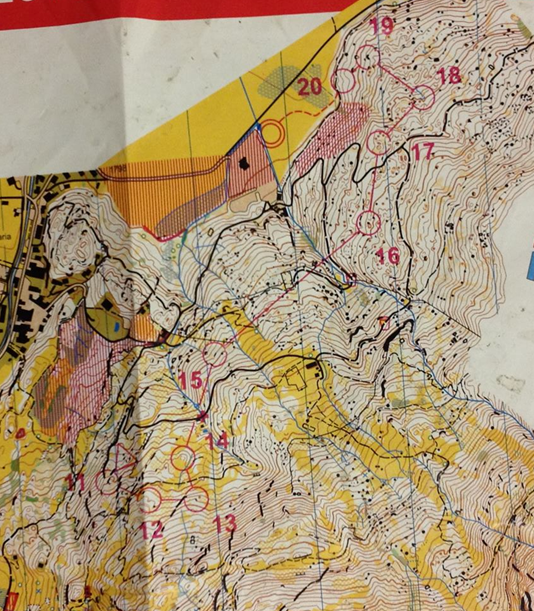 Leif: "Just get out on maps as often as you can, and challenge yourself to navigate through complex terrain." Pia: "Experience as many types of terrain as possible, even if it is just visualisation of terrain via maps found online." Robert: "Don't over-train and injure yourself. I am of course speaking from experience." Emma W: "Take any opportunity you get to make new friends, and enjoy yourself!" Michael: "Train hard and remember to have fun!" JWOC Sprint is over; preparing for the long tomorrow. Despite weather reports calling for rain in the late morning, today was a hot sunny sunny day. On the plus side, everyone had dry cobblestones to run on, but on the minus side it was a very hot day, particularly for those starting later. Emma W had the best Canadian finish with a 30th place finish followed by Robert in 111th. There were also solid first-time performances by Christian, Nicole and Leif. Both Emma S and Jan Erik improved their running times over last year. 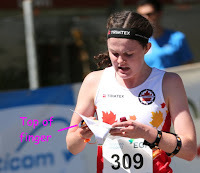 There are several pictures of the Canadian runners on the JWOC photo albums pictures from the Terrain and pictures from the Arena as well as on Orienteering Canada's Facebook page, courtesy of Nick Barrable from CompassSport magazine. We've had our team meeting for the Long tomorrow, which involves a delicate dance of assigned buses, trains, walking, and more buses as we head to a sequence of 2 (or 3) quaranteens Val Müstair. Robert will be the first starter of the day at 9:01, which means that he and Jeff are leaving our accommodation at 6:05. Breakfast is at 5:30. Click the picture to read about the fourth and fifth days at the JWOC training camp and follow along with what team Canada has been up to here in Switzerland! 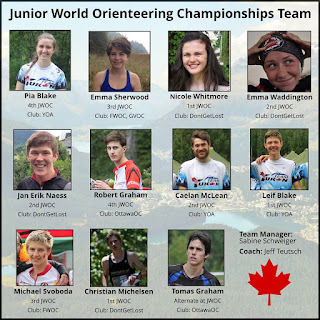 The 2016 Junior World Orienteering Championships (JWOC) run from July 9 to 15, 2016 in the Engadin region of Switzerland. 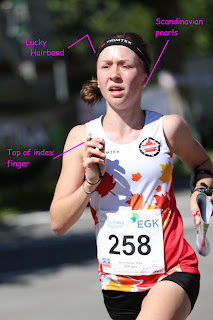 Team Canada is made up of both juniors who have raced in JWOC before, as well as younger athletes new to the international competitive scene. The team is coached this year by HPP member Jeff Teutsch of Ottawa. The team manager is Sabine Schweiger of Whitehorse. Erik Blake of Whitehorse is assisting the team with communications. Athletes compete in the sprint, middle and long distance races individually as well as the relay race with teams of 3 men or women. Canada will field two men’s teams and one women’s team. The winners are expected to finish the sprint distance in 13 to 14 minutes, the middle distance in 25 minutes, long distance in 60 to 70 minutes and the relay races in a total team time of 105 minutes. 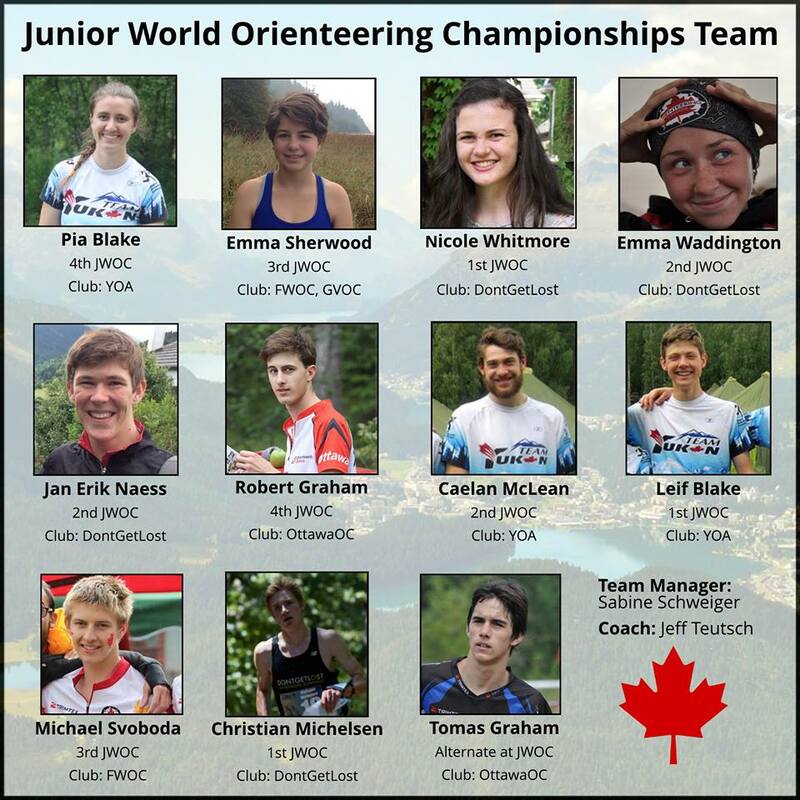 “JWOC is an introduction to international orienteering for our young athletes and an important step in their development. This year 70 percent of the team are returning athletes. We are looking for those athletes to improve on their results from last year. 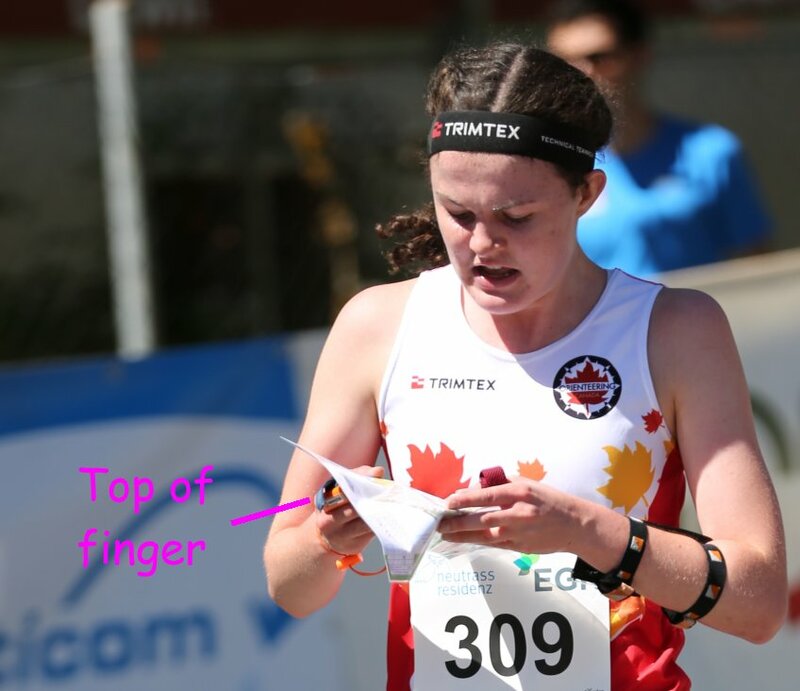 For the rookies, it is a matter of soaking up the experience and learn what it is all about,” said Brent Langbakk, High Performance Director of Orienteering Canada. 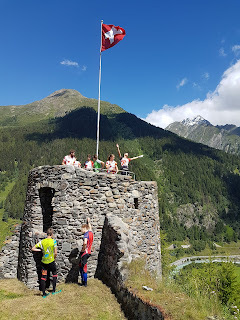 “This year’s Canadian team has spent the week of July 2nd to July 9th in the Engadin Valley preparing for the world championships, adjusting to the altitude and time-zone change, and learning what the alpine terrain is like here. 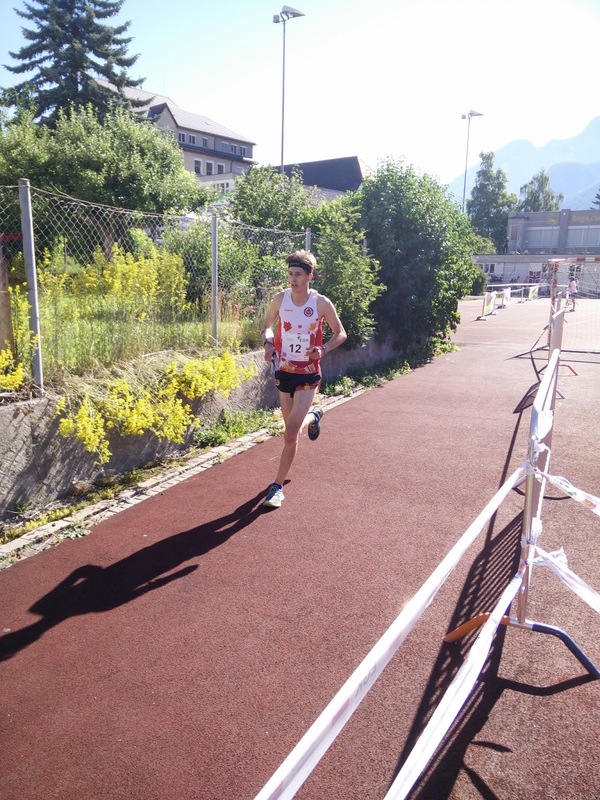 The team is feeling confident and prepared for the upcoming races and is excited to face the challenge of running 5 races in 6 days this week,” said Jeff Teutsch, Team Coach JWOC 2016. Click the picture to read about Team Canada's sprint preparation for JWOC and everything else that happened in Day 3 of the JWOC Training Camp! Be sure to check out a 2Drerun that a few of the guys put together! Click the picture to read about the Canadian Junior Team training for the few two days in Ftan, Switzerland. 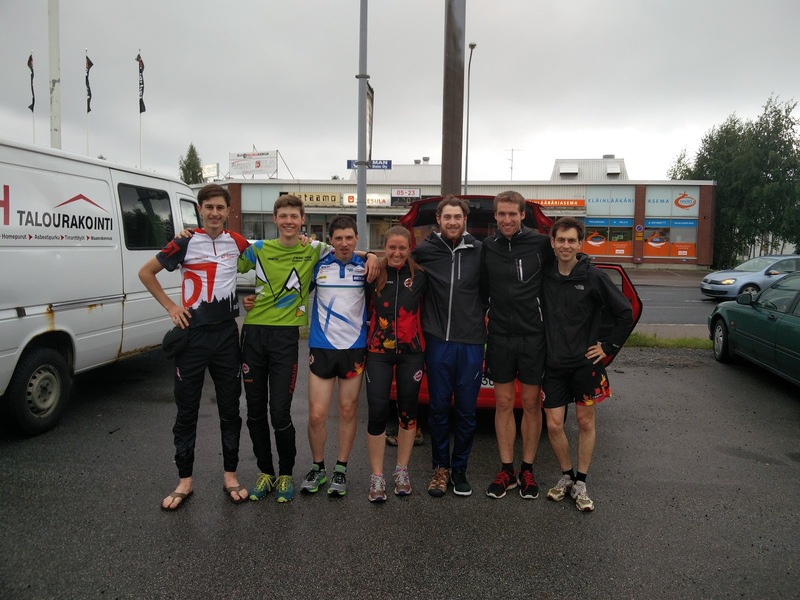 While JWOC won't be in Finland for another year, a number of the Canadians from Jukola took the opportunity to explore relevant terrain. The second Jukola was over a group of us packed up and took off to Tampere for the night before driving north to the accommodation. I am actually rather surprised that we managed to all fit into the car - three over-six-foot boys, two others and all their baggage for the summer, but we managed! 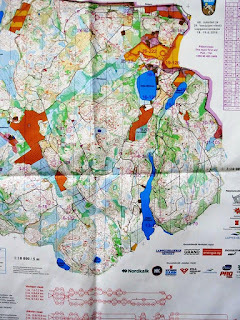 The first training was Monday afternoon, and goodness did I need that map walk. 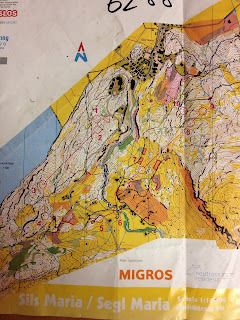 The terrain was rather flat, and there were hundreds of boulders, many of which unmapped as mapping them all would result in huge black blobs on the map. This definitely confused me at first (and indeed, continued to confuse me for the second day as well!). Day two found us on a 1:15 000 scale. 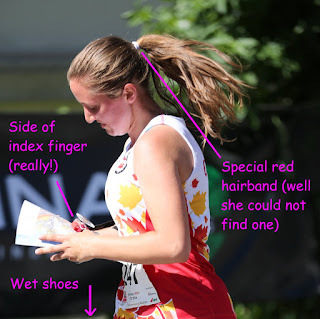 All the little details from day one were made even more challenging to read - for those competing next year: bring a magnifying glass! In the afternoon we switched back to 1:10 000, and for the first time I felt like I really had flow through the controls and was able to simplify to the right extent. 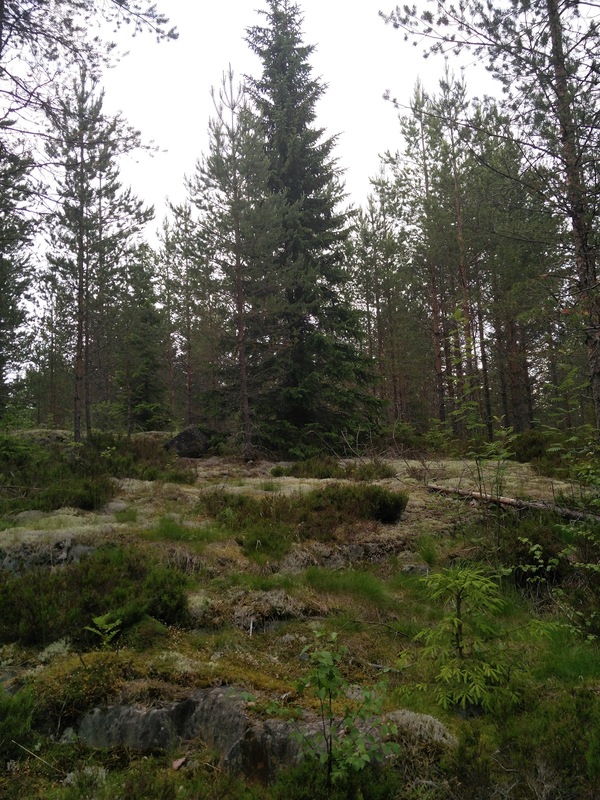 On the third day we started out with intervals on some of the gorgeous trails around our accommodation. In the afternoon we did some compass/corridor work. One thing is for certain: in Finland the mosquitoes will keep you moving. At one point, I lost where I was but was unable to stop for any length of time and find myself again unless I wanted to be eaten alive by the 'friendly' insects. The last day found us running a relay session in the morning and a sprint session in the afternoon. There was a wonderfully complicated section towards the end, as seen below. How would you go from 28-29? Thank you to Jeff for stepping in and coaching! And good luck to those going to JWOC next year - if our time there was any indication you are all in for wonderful terrain! 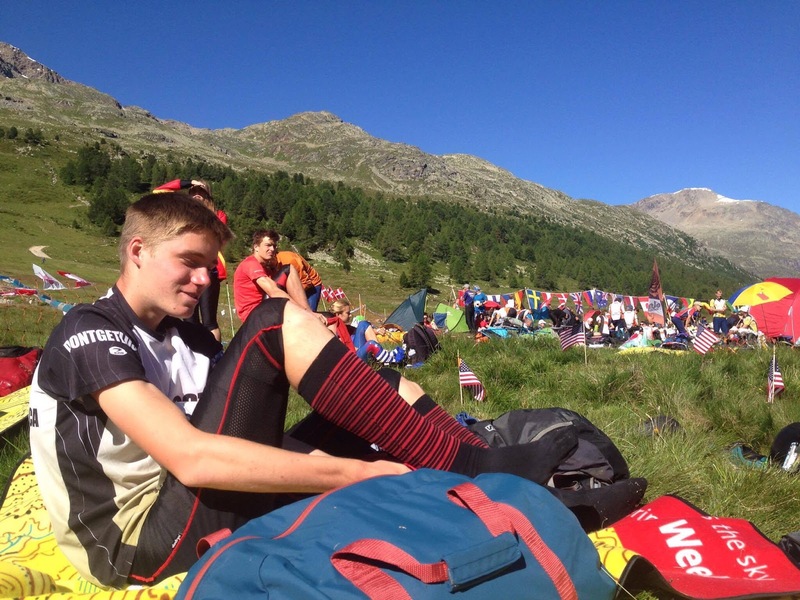 The JWOC 2016 team converged on Ftan, Switzerland, traveling variously by car, bus and train (one car took the northern route from Zürich through Austria, and owing to a missed turn, ended up in Nanders - we almost added Italy to our list of countries visited). 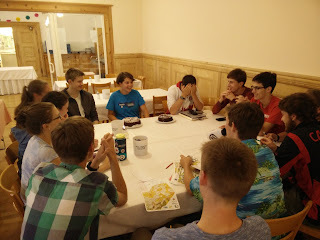 We all arrived safely in time for dinner and celebrated Emma's birthday with two Black Forest cakes! We're not sure why Jeff appears overwhelmed. 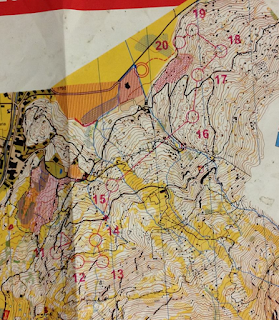 Tomorrow we will pick up our training maps in Scuol, and then get our first taste of the forest in the Engadin Valley. 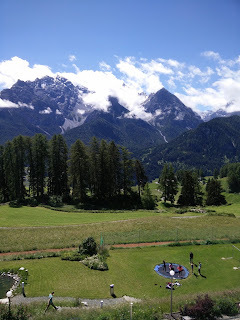 The accommodations at the Hochalpines Institut Ftan are excellent, and the food so far has been plentiful and tasty. The Canadian team has one wing on the third floor all to ourselves.